Centre piece of this scene is an unidentified coal engine together with what may be an 18" goods approaching the tall signal on the right. On the left is a grand array of glasshouses with half a dozen or so furnaces to provide heating. These would almost certainly have been coke fired so no siding for coal delivery. (Coal made the glass too dirty). I cannot even guess what part of the country this might be. A lovely scene which needs to be identified. This one is very difficult; so many clues, but despite peering at a lot of OS 1-inch maps I still cannot locate it. The date is after 1902 because the nearer loco has a middle bufferbeam lamp, and we are looking more-or-less north because the short shadows indicate a nearly overhead sun. On the LNWR - or a joint line where the LNWR supplied the signals - with the northbound double-track curving gently to the east. The long group of houses and other buildings behind that vast array of glasshouses, and the trees beyond, should make for a positive identification, but I'm stumped. One step forward. The prominent range of glasshouses -front and centre- are mobile. What looks like fence rails are actually elevated monorails and the glasshouse -suspended on wheels- can be pulled toward the viewer without the current crop getting Trampled Under Foot. This means: if you are looking to match an image the glasshouses may be a hundred foot nearer the railway. Large glasshouse spreads such as these suggest Beds. or Herts to me. There was a supplier of this style of glasshouse in Tottenham -W. Duncan Tucker- who delivered your (big) glasshouse to the nearest railway yard, packed flat of course. The double set of telegraph wires could give weight to Harry's suggestion to a joint line. Is it possible that the location is Old North Road Station on the Bedford to Cambridge line. My OPC book Oxford to Cambridge Vol 2 shows a map that looks remarkably right for a view looking towards Cambridge. Seen a similar view taken south of Oxenholme �. But the glasshouses are a mystery? South of Oxenholme? I'm afraid I can't see it. Again it isn't just the glasshouses that present a difficulty so much as that collection of buildings beyond - not just a few isolated houses but a small town, or part of one. This photograph was taken looking north from the footbridge at Kenilworth. The LNWRS ‘Study Centre’ is exactly one mile dead ahead, beyond the far away trees. Excellent work, Harry and Gary. Undoubtedly a correct identification. The shunting engine (0—6—0 — cauliflower?) is standing on No.1 down siding with a couple of open wagons. It seems to have “local goods” headlamps. The other wagons are stabled on No.2 Siding. The approaching train is on the Up Main, of course. Can its headlamps be identified? Both this photo and the Warks Rlys one were taken from the footbridge, a newer version of which still exists. 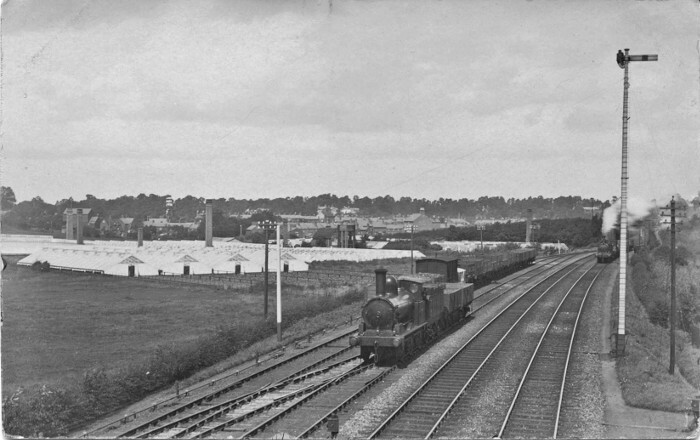 The bridge in the background is Cherry Orchard Lane, and the points connecting that end of the sidings with the Down Main were operated from a ground frame released from Kenilworth Station SB. Note that the siding connections were re-arranged between 1903 and 1923. I should be able to find the Passenger Traffic Comm minute authorising this — and thus giving the date. The 1923 revision of the map is here http://maps.nls.uk/view/115634947# . This connected the goods yard with No.1 siding (instead of No.2), and thus allowed access from both No.1 and No.2 to the yard and to the Up Main. So the mystery photo is pre-1923 (and pre whatever the date of the alteration was). The Warks Rlys photo shows the later version, obviously. Other than that, the background seems to have changed very little between 1903 and 1946. Thanks, Gary. I’m not a member of the L&NWR Society so had a quiet laugh when I realised this unrecognised mystery location was Kenilworth — of all places. The date is 1903 or not long after; the OS plan you mention was surveyed in that year, and everything fits. The Warwickshire Railways photograph was taken from the other end of the same footbridge, up to thirty years later, so shows changed pointwork and a lower arm added to the signal post. Photo No 227 would be a useful addition to Mike Musson’s Warwickshire Railways website. The engine in the foreground is quite obviously a 17—inch Coal Engine. The distant engine on the approaching train could be an 18—inch ‘Cauliflower’: maybe a close look at the original print might settle this and show what the headlamp positions are. It looks like a goods train. The overbridge in the background was Spring Lane in 1903 and later; now it seems to be where Spring Lane becomes Whitemoor Road. Can‘t see “Cherry Orchard Lane” on any map. Of course perhaps the distant engine is shunting wagons into or out of the Cherry Orchard Brickworks siding, whose points are just under the bridge. Reg — were you able to find the minute authorising the change in the Kenilworth layout between 1903 and 1923? The appearance of the water tower (that’s the tall white-striped object in front of the distant trees, above the first and second glasshouses from the left) — suggests to local historian Robin Leach that the date of this photograph is 1907 or later.